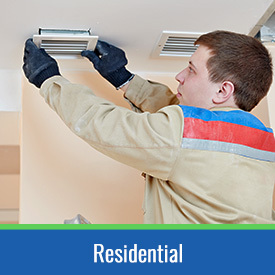 Residential Air Duct Cleaning – Clean Air America offers the best residential air duct cleaning services in Akron. Many of our competitors utilize portable vacuums for air duct cleaning, and these produce just 400 to 4,000 cubic feet per minute. Clean Air America, however, deploys powerful PTO-driven vacuum trucks to each residence, and these can produce 16,000 cubic feet per minute. Commercial Air Duct Cleaning – Akron boasts a storied industrial history, so it should come as no surprise that Clean Air America offers professional commercial air duct cleaning for the area. Having your business’s air ducts regularly cleaned has the potential to greatly improve the health of your employees, thus increasing your workforce’s productivity. Ultraviolet Germicidal Light Air Purification – Not only will our Fresh-Aire Blue-Tube UV Germicidal Ultraviolet Light System provide you and your family with consistent, low-maintenance air purification, but it will also eliminate many persistent household odors. Our technicians will guide you in choosing the lamp model that is best for your home. Dryer Vent Cleaning – Did you know that clogged dryer vents have a negative effect on indoor air quality? Our technicians will inspect and evaluate your dryer vent using our proven and thorough eight-step process. Wherever You Live Or Work In Akron, We Can Help! Clean Air America is committed to serving Akron and all of its zip codes: 44301, 44306, 44307, 44308, 44302, 44303, 44304, 44305, 44309, 44310, 44311, 44315, 44316, 44321, 44325, 44326, 44372, 44396, 44312, 44313, 44314, 44317, 44319, 44320, 44328, 44333, and 44398. We travel all along I-76, I-77, Collier Rd, Wadsworth Rd, OH-8, and all throughout Akron, and are committed to serving as many of our neighbors as we can. In addition to providing commercial and residential air duct cleaning to Akron, Clean Air America serves the entirety of Summit County, OH. Contact us today for a free estimate! Our pricing is and always will be transparent; there are never any hidden fees associated with our services. Request an appointment online here! The folks in Beachwood, a nearby part of our service area, breathe a healthier sigh of relief once we’ve cleaned their air ducts.